With temperatures warming up in Austin, we could only expect the music scene to be heating up as well! Plan on making a trip to the ATX to enjoy the beautiful weather, and make sure to jam pack your May weekends with live music! Some of our favorite festivals coming up this spring are Austin Psych Fest and Pachanga Latino Music Festival. 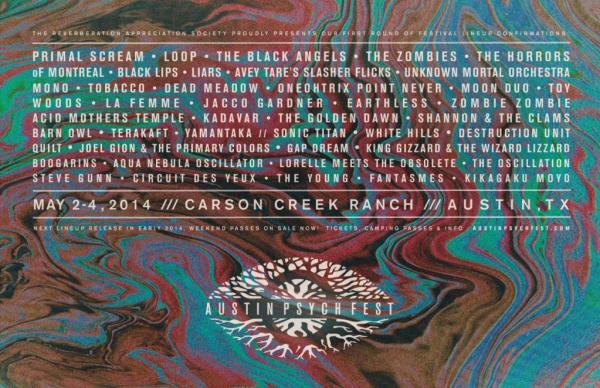 This upcoming weekend, plan to attend Austin Psych Fest, May 2-4, 2014 to see The Dandy Warhols, Panda Bear, The War on Drugs, Le Femme, Black Lips and The Octopus Project. Austin Music Volume 13 artist The Black Angels will also be showcased! This festival is just a short drive away at Carson Creek Ranch, located on the Colorado River. Local vendors will be selling food, drinks, merchandise and more. If you&apos;re looking for somewhere to stay during the event, check out the camping offered by the festival. Our True Austin music blogger, Greg Ackerman, shares his 5 Must See Acts. The following weekend, May 10th, head to Fiesta Gardens for Pachanga. The event is a Latin-filled day of music, cultural arts and food! Youll find several different genres of music ranging from rock to salsa. The lineup includes La Santa Cecilia, Gaby Moreno, DMK, La Vida Boheme and Chicha Libre. Nios Rock Pachanga is an opportunity for the little ones to discover music- children under 12 are free! Adjust your schedules accordingly, and make time to see some of Austin&apos;s greatest music in the spring. Check out @MusicAustin for more up-to-date details.